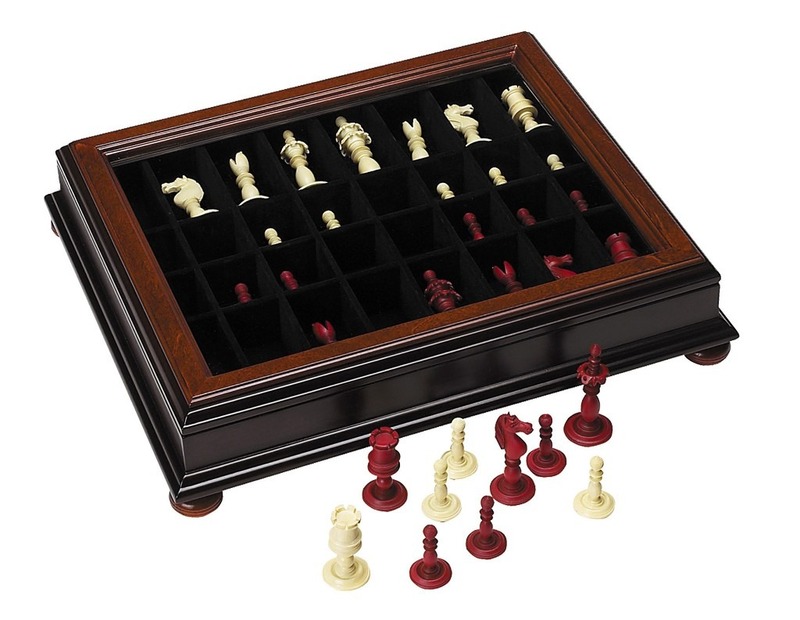 This beautifully rich combination of chessmen and display case is a wonderful complement to any collection. The House of Staunton is proud to offer the Calvert Chess set. 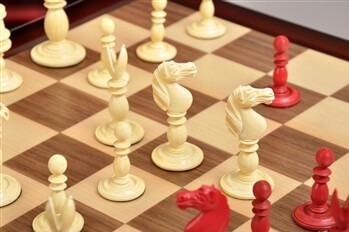 It features a 3.5" King is a highly detailed and accurate reproduction of the Circa 1810 English Playing Chess Set design referred to as the Calvert Pattern. It is often, but wrongly, attributed to John Calvert, a Master of the Worshipful Company of Turners, located at 189 Fleet Street, from around 1790 to 1840. He specialized in exquisitely turned Chess sets for the aristocracy and in ebony/boxwood for the many coffee shops and clubs where Chess was a popular pastime. Chessmen of this type were actually manufactured throughout the early-to-mid Victorian period by John Jaques of London and Thomas Lund of Cornhill. 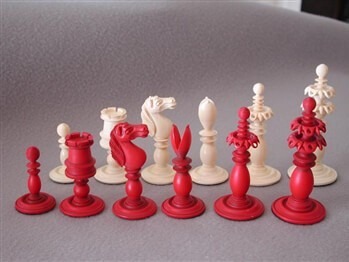 The Calvert playing sets were ultimately supplanted by the Staunton pattern chessmen, which were introduced to the public in the fall of 1849 by the firm of John Jaques of London. 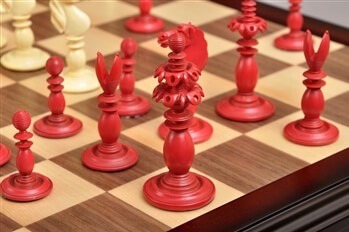 This reproduction is an exact copy, of an original Calvert Chess set. It dates from around 1810, at which time white and red colored pieces were popular. The slender baluster stems and the unusual form of the King and Queen with their pierced floral crowns, makes an attractive and highly decorative design. The display case features a glass lid and measures 14.75" L x 12.5" W x 3.25" D.